Halcón Resources is buying GeoResources for $37.97 a share in a cash and stock offer. NEW YORK ( TheStreet) - Halcón Resources ( HK - Get Report) is buying GeoResources ( GEOI at a value of roughly $1 billion in a cash and stock offer that will more than double its oil and gas reserves. The deal also pushes Halcón Resources, a company that acquires and then develops oil and natural gas assets, further into shale and unconventional energy exploration such as the Williston Basin of Montana, North and South Dakota. In the deal, Halcón Resources will pay $20 in cash and a stock conversion of 1.932 of its shares for each share of GeoResources, valuing the company at $37.97 a share or a 23% premium to Monday's closing price. 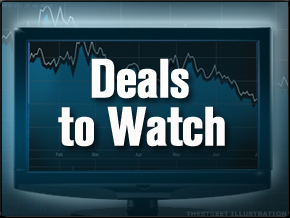 The merger adds to a 2012 flurry of deals related to unconventional drilling oil and gas plays. However, like other energy deals this year, the merger targets liquid oil and gas assets. After the merger announcement, GeoResources shares rose more than 18% to an all-time high of $36.41 in premarket trading. According to Google Finance, the company has been publicly traded since the late 1970s. "This transaction represents a significant opportunity for the shareholders of both companies to benefit from the combined strengths of Halcón Resources and GeoResources and is immediately accretive to discretionary cash flow, production and reserves on a per share basis," said Floyd Wilson, CEO of Halcón Resources, in a press release.
" The transaction will effectively increase our estimated proved reserves by over 150% to approximately 52.8 million barrels of oil equivalent, 69% of which is liquids, and substantially increase our average net daily production by over 170% to approximately 11,070 barrels of oil equivalent based on fourth quarter," he added. The deal, which has been approved by the boards of both companies, still needs shareholder approval. Both companies expect to complete the merger in the third quarter of 2012. Upon completion of the merger, the stockholders of GeoResources will own roughly 18% of the combined company's outstanding shares. "We are excited about the opportunity to partner with a company that is well positioned to become a leading liquids-focused resource player," said Frank Lodzinski, CEO of GeoResources, in a statement. Barclays and Mitchell Energy Advisors acted as financial advisers to Halcón Resources and Wells Fargo Securities advised GeoResources.